9th Meeting of the Carpathian Convention Sustainable Tourism Working Group took place on 12-14 of September in Brasov, Romania. Iryna Shchoka represented European Wilderness Society on this meeting. reviewed the presentation on the draft Set of Indicators for Measuring positive and negative Impacts in destinations of the Carpathians (by Michael Meyer) and discussed involvement of Parties for integrating the set of indicators into their monitoring systems. On Thursday, September 14 separate meeting of 2 established Carpathian Sustainable Tourism Centers: Romania and Ukraine was held. 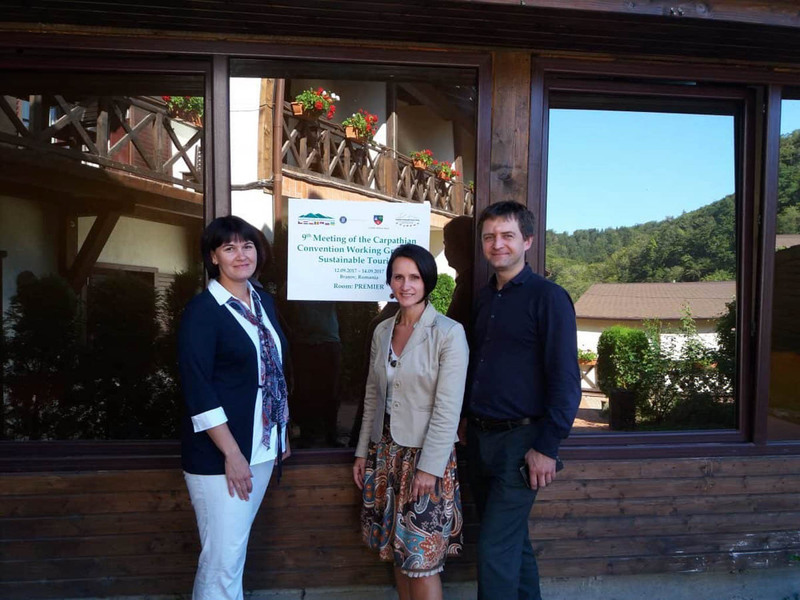 Their representatives visited office of the Romanian Carpathian Sustainable Tourism Center and discussed further possible common activities. Next meeting of two Centers is scheduled to take place late this autumn in Uzhhorod, Ukraine. Now Tourism week for Iryna and Valik from European Wilderness Society is continuing with number of meetings, conferences and fair in Uzhhorod, Ukraine.